System Windows™, Linux, Mac OS, Solaris, FreeBSD, etc. Brand All brands including LaCie, Buffalo TeraStation™, cisco Linksys, SNAP server, QNAP, FreeNAS, Adaptec, etc. All fees are fully refunded if data is not recovered. The following table compares the costs and estimated length of time. Additional fees are applicable if any hard drives require physically repair. Add (subtract) $100 for each additional (fewer) drive. Add 25% for RAID 6 or RAIDZ. If the device contains virtual machines (VMDK, VHD, etc. ), a small per-VM fee may be applicable. What can I say, but "THANKS!"? We experienced a power outage leading to a RAID failure. I contacted Quetek on a Saturday afternoon, figuring I'd have to wait until Monday for a response. Ty called me within a few minutes. I explained the issue to him and he went to work remotely analyzing our data. In a short time, he and his team were able to tell me details about the RAID that I didn't even now, including a drive that had failed that the controller did not report to us. He was able to recover all of our data, which REALLY saved the day. I thought the pricing was very reasonable, especially considering working on the weekend and the responsiveness experienced. I cannot say enough good thinks about the service Quetek provided, and I would highly recommend them to anyone who needs data recovery. We had a power supply fail that damaged the RAID controller of an older 3TB archive NAS in our network. The unit was RAID 5 hardware controlled, and hard to source spares for. Even after repairs the unit couldn't rebuild it's file system. We tried 3 different NAS recovery software packages, none of which could fully recover the file system. We even cloned and mounted the disks under Ubuntu and tried to recombining the RAID set, but with no useful result. After a week of this, and seeing their reviews on several forums, we called Quetek. We were given a good fixed price and clear communication at every step of the recovery process. My only regret is that we didn't just skip the attempts ourselves and contact them first. Quetek and File Scavenger are truly great - 6 hours later we had a fully recovered data set! A really excellent service! Right about the end of the month our mail system began its cron job to archive the previous month's emails. First it clears space on the target then begins the rsync of the user mail directories. In the process of moving last month's archive file the controller lost the RAID information and stopped hard. The archive file never was created and the mail RAID array reported the 4 drives, but only one drive was showing the proper size, the three others showing only 445 MB! Most of the next three days were a panic . after removing all drives and making an image of all four, I tried a few different utilities . none of which could even see the folder structure on the drives (Linux, EXT3). By this time I was desperate and depressed. After a short web search I came upon Quetek. After seeing all the different file types and arrays that it would see (so they claimed), I bought a copy and began working on the image files. It was getting close at times but even though it found the directories, the data was still fragmented. It was then I contacted Quetek support. They were able to establish a remote session with the recovery PC and began examining the files. They correctly determined the configuration of the array before the meltdown, and using those parameters was able to recover better than 98% of the email on the array!! Nine hours later we had a viable recovery to restore to each user's accounts. Other services quoted me thousands of dollars just to get started. The cost was under $1K and if they had been unsuccessful would have refunded the cost! I still can't believe how well the software and their support worked. To say Ty and his team are heros is an understatement. I would recommend them without reservation for any hard drive recovery needs. Ervin Suarez - Technik Inc.
Our Seagate NAS appliance crashed and the RAID 5 configuration was completely lost after a drive failure. We immediately contacted Quetek for assessing our current drives and data recovery options. They walked us through the process connecting our drives to another system. They installed their software utility, scanned our drives and rebuilt our RAID 5 array. Within 24 hours, they had all of our data recovered. I highly recommend Quetek to anyone that has lost valuable information. They were very professional, got the job done and never asked for payment until DATA was recoverable. Great Job Quetek. I know you hear the phrase "Don't try this at home" frequently and I would say attempting to recover a four (4) disk RAID 5 array that is broken is something that falls into that category and should be left to professionals. I recently called Quetek and I found them to be extremely easy to deal with. They asked that I attach the drives to a separate computer (the drives were in a Seagate Blackarmor 440), then run their remote control software, give them access to the computer and allow them to attempt the recovery. After a day they told me they believed they could recover most of the array, they actually recovered all of it. While the price may seem to be a lot for some people I found it reasonable compared to the amount of time I had already spent attempting to recover the array. They have a money back guarantee so my comfort level was raised immediately when I found that if they were unable to recover almost everything I could get my money returned. So to sum it up, I most positively recommend QueTek for file recovery. I am 74 years old, built a kit in 1977, owned several software companies and consider myself very savvy when solving computer problems. However when asked in the future how to recover a RAID volume or repair a RAID array I will have a two word answer "Call QueTek." Thanks a lot, I know I paid you but I am in your debt. I just wanted to thank you for everything you did the last couple of days. As far as we can tell everything seems to be recovered just the way it was before the crash. I didn't know what to expect when I came across your company but I have to say you guys are awesome and saved me a lot of heart ache. Thanks again for everything you did. Thank you so much of your help. I have now recovered all of my data with the original filenames and folder structure. I was quoted $3,000 by a local company to do the exact same thing. Your price and service far exceeded my expectations. I would highly recommend your company to anyone I know. Once again, thank you for saving my data at a price that I could afford. It is now ready and I copy the Data to Big Network Drive. Thanks very much I am happy the Data is already here and no data was lost. Thanks Thanks Thanks. Thank you so much for helping me to rescue my data. My Linux server with a 6 TB RAID 5 array lost two disks back to back, but you were able to piece the array back together, reconstruct the LVM physical and logical volumes and Ext3 file system and get all my data back. I looked at several companies and yours stood head and shoulders above the others. Thanks again, you are the best. Ok, this really took a while to fully recover, it was terribly slow as expected due to the 0.5K block size. But the good news is: It recovered the full 100%: I cannot detect any corrupted files so far. I'd like to thank you and the whole team at QueTek!!! Great job! If I ever encounter a HD problem that I cannot resolve myself I sure know where to ask for help. Requisite data was completely recovered. I just finished getting everyone reconnected with their PST files. So far there only seems to be one file that needs scanpst treatment to fix a few issues. I'd say that you did an excellent job of virtually 100% recovery. I thank you for your tremendous efforts in getting us back up and running. Our data had redundant backups - all had failed or were corrupted. The array was down and none of the disks could be accessed. Our staff urgently needed access to this data. I contacted the hardware vendor and they did not offer remote assistance AND wanted 5000.00/day for an on-site consultant and offered NO GUARANTEE. Enter QueTek™. Their staff responded IMMEDIATELY and got to work on a solution for us. They worked relentlessly until our data was recovered and restored. All for a fraction of the price charged by their competitors. I can't thank you enough QueTek™! Joshua Wright - Senior Systems Engineer - Play Along, a division of JAKKS Pacific Inc. I just wanted to take a moment and thank you for your help. We recovered nearly everything without incident, and the only issue we have seen is that some Virtual HardDrive images from some vmware machines that were stored on that array didn't recover successfully, but we are back up and running thanks to you. So thanks! Just received the drives, everything seems perfect- I'm copying the recovered data onto my new box as I type. Everything went very well yesterday. All data seems to be recovered. The procedure was easy and I didn't need any help. I appreciate your work and thank you for a job well done. We cannot thank you and your staff enough for all of your help in recovering our raid. Of over 209,000 files we only lost 43 and they were not even necessary. Once again thank you and your staff. Being a Hobbyist, I have a rather oddball configuration, overpowered with a Software RAID-5 array of 3000 GB, built with 11+1 disks. When Windows refused for no apparent reason to recognize the array, I was devastated. Isn't RAID-5 supposed to be fault tolerant? My life was in there, 20 years of data, photographs, movies, everything! I looked around and try almost every tool for RAID recovery I could find, not a single one could recover properly files bigger than 1MB. The disks order was unknown to me, but how could I have guessed with 11 disks (that's almost 40 millions different arrangements!!). So after a week of pain and agony trying everything I could imagine, I finally asked QueTek™ to try to recover the files for me. What a relief! After amazingly fast mail exchange to help with my suffering, the guys at QueTek™ analyzed remotely the problem and provided the disk order and a way to recover the data! A few hours later!! The whole 3000 GB is now back!!! Thanks QueTek™ for providing your amazing expertise at an affordable price. You didn't save my life, but for sure you saved my sanity! Our company was on the verge of losing almost a TB of RAID 5 data up until we contacted QueTek™. The techs at QueTek™ reassured us they would do their best to recover as much as possible and that, they did. They were especially accommodating to all our requests. If you have mission critical data on disk somewhere, it's always nice to know QueTek™ is around for those times you need them the most. I would like to thank you again for your exceptional and professional work in recovering data from my failed Raid 5 disks. I was told by many people that once two disks failed at same time on a 4-disk Raid 5, my chance of getting the data back diminishes dramatically. Your expert procedure in iteratively re-patching and restoring the data is truly magic. I would recommend you to any one who needs Raid recovery services. While wrestling with a dying RAID 5 array at 4am, I came across your website, and am so glad that I did. I didn't realize immediately that your business was half a mile from mine, I did know that there was some data on that array that wasn't backed up, and was very important to me. I was heartened but a little skeptical of our 95% recovery rate, but you're batting a thousand with me, or 650,000 - the number of files that you recovered from the array. Thank you for the File Scavenger® software. We called you with an array that was broken and we were unable to determine the actual configuration. You explained the process, our options and were very accurate in your time predictions. You were able to identify the RAID configuration and disk placement. You sent us complete, accurate and clear instructions on the steps that we followed without incident. It was surprisingly easy! When we realized that we had a problem with the data, we called several Data Recovery Services who offered the data recovery service in the neighborhood of $15,000. with a 3-5 day turn around. Upon a recommendation of a colleague, we contacted QueTek™. With your software (and support staff) we were able to recover the 400GB of data in about 9 hours and at a cost of less than $1,000. You saved not only the data, recovery time, and money but ultimately... my job! I hope we never need to talk again, but rest assured we would not hesitate to call you in the event of a future catastrophe like this one. Again, I can not thank you enough! We have verified all our data has been recovered. Please forward our original drives back and delete files from your system. Thank you for your great work. Just wanted to let you know that everything appears to have worked wonderfully. Almost every file I've tried so far has worked perfectly. Thank you very very much. You saved me a lot of headache, and expense. I will recommend your software and services to anyone that needs data recovery. I really love your service and software. You literally saved our business. If anything happens with our client's drives, I would definitely recommend your company. I'm impressed and grateful. Not all files work, but well over 90 percent. It's a good result, thank you. I'll be back! Everything seems to be working fine and will leave it running until tomorrow morning. I would like to thank you for the excellent support and has been a pleasure dealing with QueTek™. I was hesitant believing you could do it for no1. the price you were doing this for. Everyone else was asking for 10 times the amount and no2: hesitant dealing with a international based company. The data recovered was extremely important and is invaluable - something that could not be re-created. It was extremely unfortunate that our back up server had gone down and that information was lost no where to be found. I honestly do not know how to THANK YOU and show my appreciation. Support was practically 24 hours and a unbelievable e-mail reply times. QueTek™ is truly unique service. Once again thank you and I definitely know where to forward my data recovery recommendations in the future. "We had a four-disk RAID 5 set that failed completely with all of our company's data on it. We hadn't backed up since the end of the previous month so it looked as though the accident would cost us thousands of dollars in data-reentry time and lost billings. Some timesheets existed only on the system. To get the information back would have depended on what staff remembered. We got a quotation from a reputable local company of US$2,000 - $4,000 to recover the RAID set so we thought we'd look on Google and found QueTek™. Even with the fifteen-hour time difference between Sydney, Australia and Texas we had emails answered in less than two hours and sometimes in ten minutes. After using the online recovery service we got everything back. All 50,000 files. Fantastic." "When the directory on my RAID 0 system became corrupt, I tried a lot of products, and talked and emailed to a lot of people. I came across products that didn't work to ones that got close but still didn't recover my files. I came across people who knew some but not enough, to people who I must say were pretty much clueless yet were still quite willing to 'try' for a hefty price. I kept thinking there had to be a technical person out there who had the tool and expertise to recover these files at a reasonable cost. When I finally happened upon the staff at QueTek™ and their tool, all my hopes were met. The tool worked, the staff were extremely helpful, the cost was reasonable and I recovered all my files. I was very impressed and pleased. After successfully working with QueTek, the others I contacted seem like charlatans and price gougers." Great! The recover finished and it looks like every was recovered to the new 3TB drive. I'm just cleaning up and making another back and doing an Amazon Glacier back. Thank you so much. This recovery was worth every penny. I will definitely recommend you guys to my friends. Having my RAID fail I was at a total loss and felt completely devastated. I had a NAS at the home office running a RAID 5 and felt that was protection enough (I know better now). The manufacture tech support suggested my only route was Data Recovery. Having talked with Ty at Quetek I realized I had no knowledge of the complexity of the encryption in my RAID and I desperately needed help to recover my data. This data was the bloodline of my business. Ty walked me through my various options and suggested that from what I told him I had a high probability of recovery but we would not no until we did some tests. I brought my filed RAID to the office and these guys worked remotely day and night and on the weekend till all my data was recovered and backed up. They literally saved me! 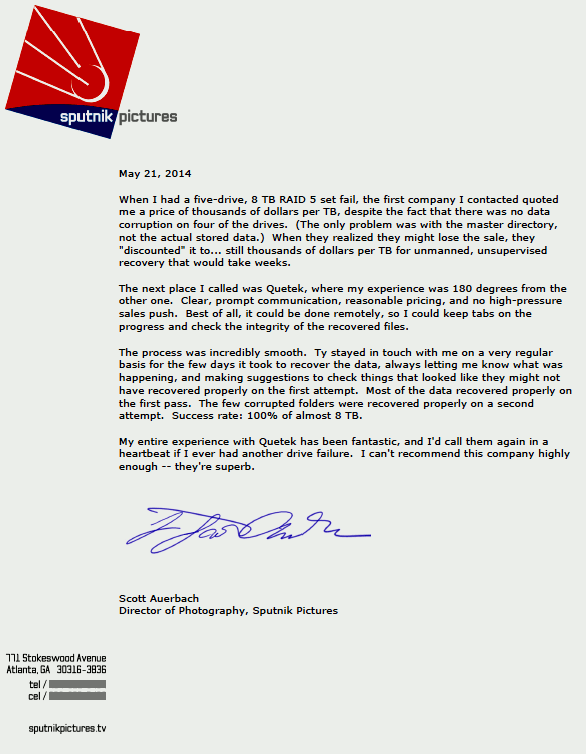 I cannot thank Mr. Ty enough and the whole Quetek team!